Tekapo Tourism videocam - Brought to you by Air Safaris, providers of scenic flights over the Mt Cook and Westland National Parks. Click here to access the video feed from that same camera. Experience 200km of some of the world's most spectacular alpine and sub tropical scenery, including New Zealand's highest peaks and longest glaciers in a landscape of contrasts, the result of millions of years of the earth's crusts colliding. Visit their website to find out more information about their spectacular Grand Traverse scenic flight around Mt Cook/Aoraki and Westland National parks. 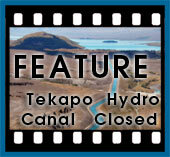 Welcome to the Tekapo Tourism videocam. If you have common plug-in Java installed, you can view the live video feed from our hill-top mounted camera. The resolution of this video-cam is 362x280 pixels. For detailed 1920x1080 pixel images of Tekapo, go to the HD webcam page. Camera will time out after 90 seconds. Refresh this page to reactivate. Please provide courtesy to other users and wait your turn. THIS CAMERA IS NO LONGER FULLY COMPATIBLE WITH MOST MODERN WEB BROWSERS. Due to the default security settings of most modern browsers and the early operating system of this older camera, you now may have to select a view and refresh the page for it to show. Some browsers may not work with the camera at all. We apologise for the inconvenience. We have since added a full HD camera for capturing still images as an alternative. The drop down menu below contains the list of views available to the camera. Click one to move camera to that view.